Scratch Baking Co.'s new Toast Bar should open in the next few weeks, the owners say. SOUTH PORTLAND — It’s taken longer than expected, but Scratch Baking Co. plans to open its Toast Bar in the next few weeks. The new venture on Broadway near the Ferry Village neighborhood will feature bagels, breads, and English muffins, toasted and topped with a variety of spreads, served with specialty coffees, teas, and juices. The new Toast Bar will be adjacent to Scratch’s Bread Kitchen, 205 Broadway, at the corner of Sawyer Street, and will seat 10 to 12. It will have a stand-up bar along the window and picnic tables behind the building. Swanberg, who owns the business with husband Bob Johnson and business partner Allison Reid, said they call it “slow Scratch.” Instead of people running in to grab a quick dozen bagels, like the self-serve station at Willard Square, people will line up and be served. “If it doesn’t toast, we don’t have it,” Reid quipped. Customers who want Scratch’s pastries, cakes, cookies and other sweets will have to visit the Willard Square store, where Reid said nothing will change. The bakery opened in June 2004 under the name of “One Fifty Ate at Willard Square” and in December 2006, its name was changed to Scratch Baking Co.
Swanberg said people have been asking for years for toasted bagels. 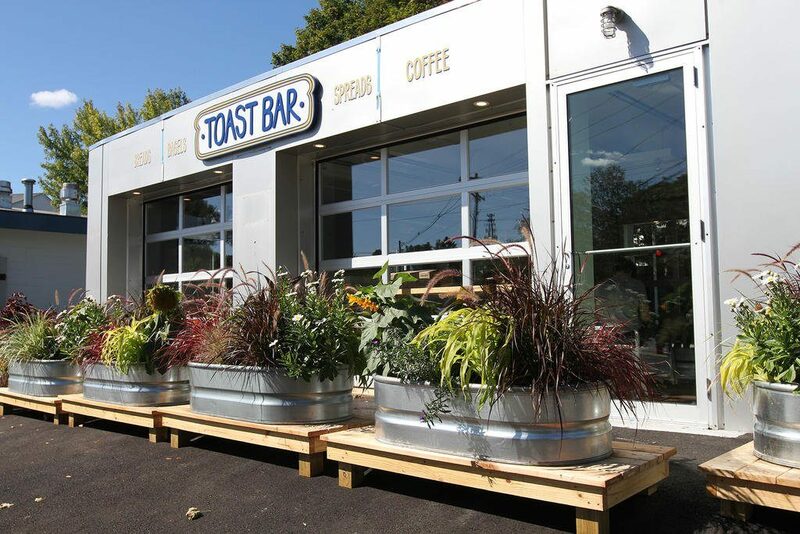 The Toast Bar concept was announced in April 2016. The business moved its bread and bagel making operations into the former Getty gas station on Broadway last September. But it has taken even longer to complete the 900-square-foot Toast Bar, where gleaming glass and metal garage doors allow natural light into an interior of white and gray, with accents of blue and steel. Large pots of flowers decorate the front of the building, softening the graphic lines and beckoning bagel lovers. The bar will feature all six of Scratch’s well known bagel varieties: plain, Maine sea salt, sesame, poppy, everything and whole wheat. Breads will include Country Miche and Whole 9 multi-Grain daily, as well, as a rotating and seasonal selection. Toppings will include cream cheeses, Casco Bay butter, Myrt’s pimento cheese, homemade jams and jellies, and nut butters including a chocolate and almond spread. Swanberg said the infrastructure is complete and fully staffed, but they are waiting for tables and will do dry runs before the business formally opens to the public. To say Reid is a fan of toast would be an understatement. She has her own toast bar in her South Portland home, which she calls a “shrine to toast” where friends and neighbors visit and enjoy toast together at the wood-topped bar. Her home toast bar has a commercial-grade toaster, a bread box to display condiments, and baskets for bread. Reid even has pictures of toast on the wall, Swanberg said.